I was so excited when Amazon delivered early (click here for the exact one she bought me) and rushed it upstairs. Peeked inside and grabbed the instruction manual, was met with about a dozen different warnings of how the steam would burn my eyeballs off, and proceeded to let it sit in its box for the next two days. I pulled it out, I had kitchen gloves on each hand & literally wore glasses, then I calmed down. It's totally fun, you guys! Ya, there's some intense steam that comes out when you quick release the pressure. It's a lot of buttons. But it's so satisfying to use, and so dang fast! I'm obsessed. The first stop was eggs- and after a couple of tries I got it *just right* and had to share with you guys! These instructions are a bit more spelled out and in detail than some of you will need. However, I wanted my Instant Pot newbies to feel comfortable and like they don't need to be afraid and can so do this! Which is what I needed too. So I included all the little steps. If you have questions still, please ask! I'd love to help you use this fun kitchen tool! It really is amazing. Enjoy your Instant Pot- because it should be your friend! And stay tuned afterward for an easy breakfast or lunch idea that we prepare often. It's tasty served hot or cold! Place the rack or basket in the bottom of the pot. Pour in the water, then place the eggs on the rack. Put the lid on, and set the valve to "Sealing". Set to manual pressure cook on "High" for 5 minutes. The cooker will take some time to warm, then the cook time will begin. When done, use a quick release: hit cancel, and move the valve to "venting". (watch your fingers, maybe use a towel to protect them from the steam!) Place a towel over the valve if you want to keep any steam spatter minimized. 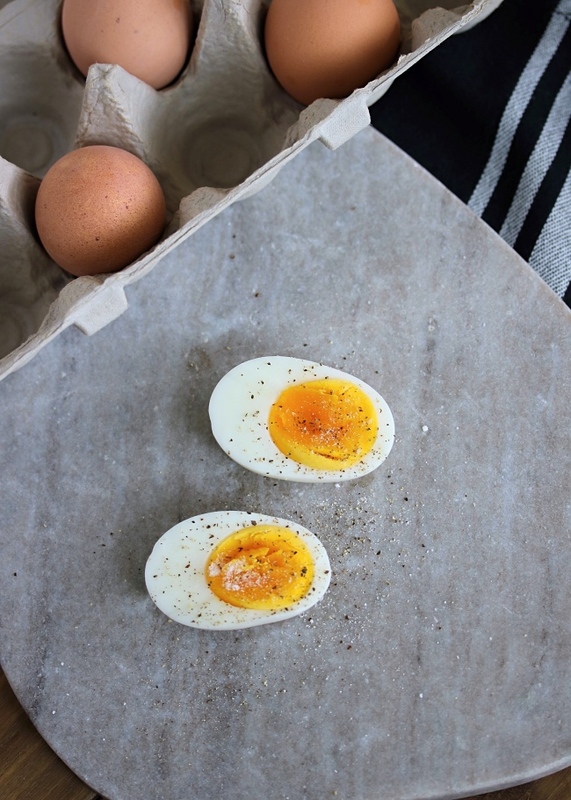 Transfer the entire rack of eggs into a large bowl of ice water. 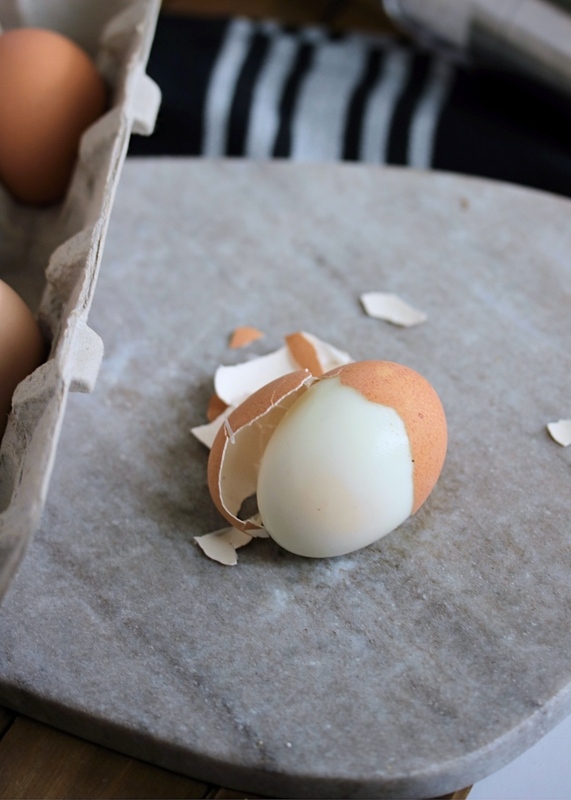 Ice the eggs until just cool enough to handle, then peel them immediately. I cook mine for 5 minutes, which yields a hard boiled egg with a slightly soft center. Go down to 4 minutes for soft, and increase to 6 minutes for hard. 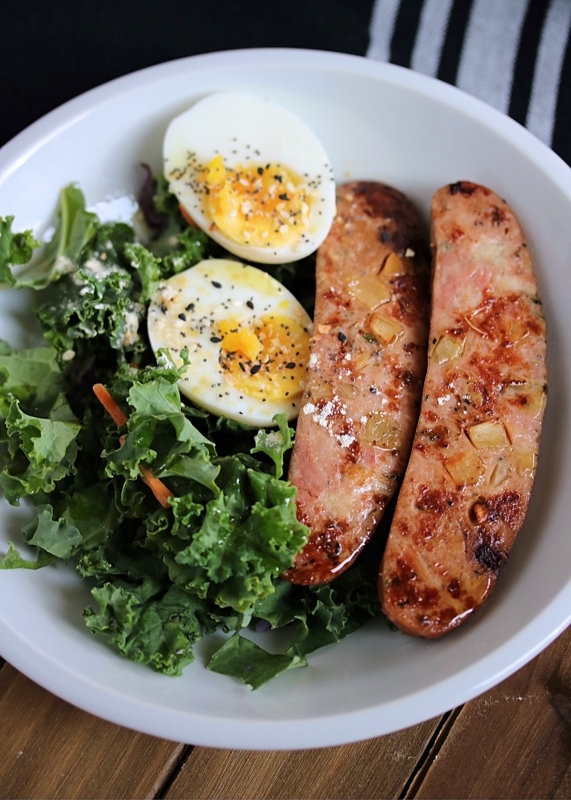 Slice the sausage lengthwise into two, and grill until browned. In a bowl, arrange the greens on the bottom. 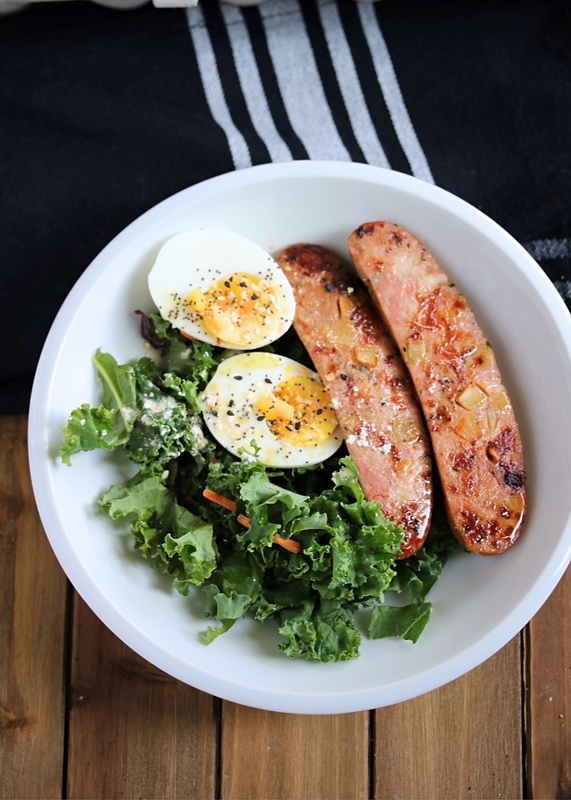 Top with halved eggs and the grilled sausage. Drizzle the entire bowl with olive or avocado oil, and sprinkle with seasonings. I often add a dash of hot sauce. Heat the entire bowl for 30 seconds to steam the greens, or eat it as is. You can prep one bowl at a time, or cook in batch like I do. 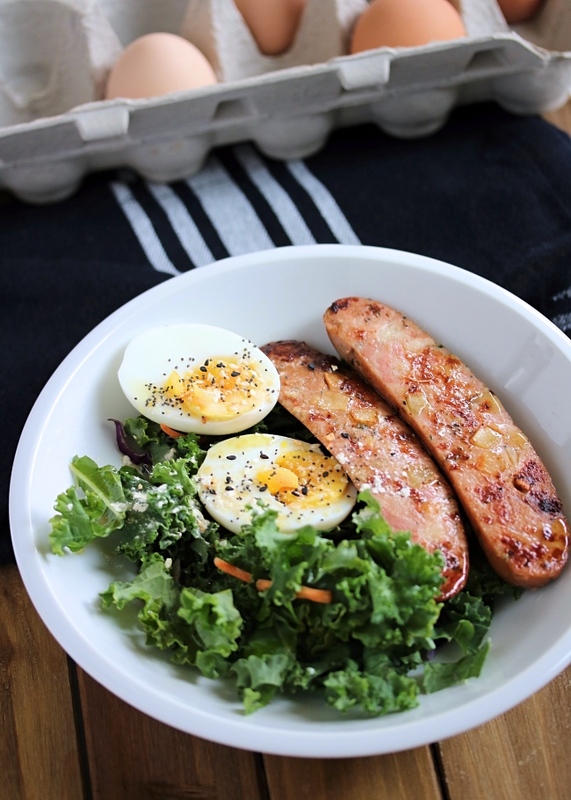 Bowls can be stored in the refrigerator and heated each morning, or you can store the cooked eggs & sausages in the fridge and assemble a bowl when you're ready. Hi Jessie! 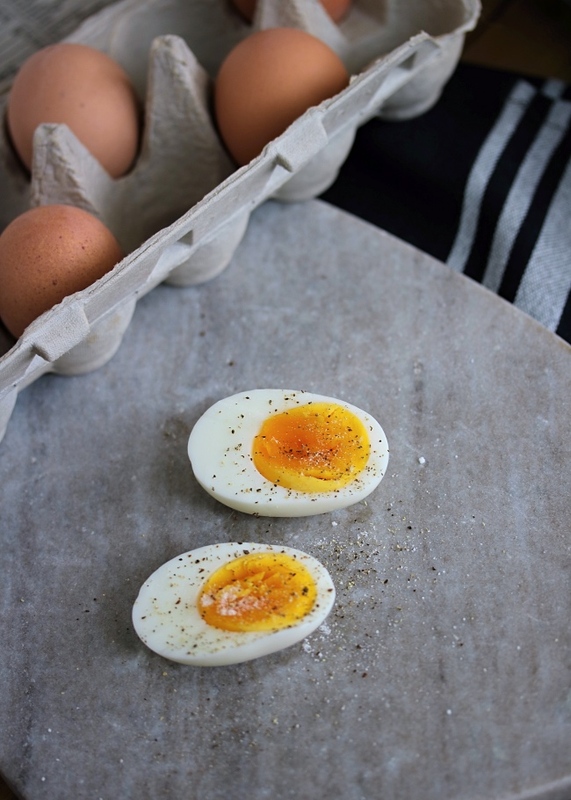 I love the idea of using the Instant Pot for eggs. I have to admit I am one of those people afraid to use the Instant Pot.. I bought it before the holidays and have yet to fully take it out of the box, but this may just be the first thing I'll try. Just one question - do you the think the size of the Instant Pot you have makes a difference? I have the mini so just wondering if I could still do 6 eggs or if it would be too crowded. Thanks for the inspiration/motivation! Hi Jessie, I use my instant pot all the time to cook frozen chicken breast and frozen vegetables. I add a cup of chicken broth and set it to the poultry setting and in 30 minutes all is good. Also throw in some seasoning of choice. Jessie, you're such a great teacher. Thank you for this. Dathan is one lucky guy.